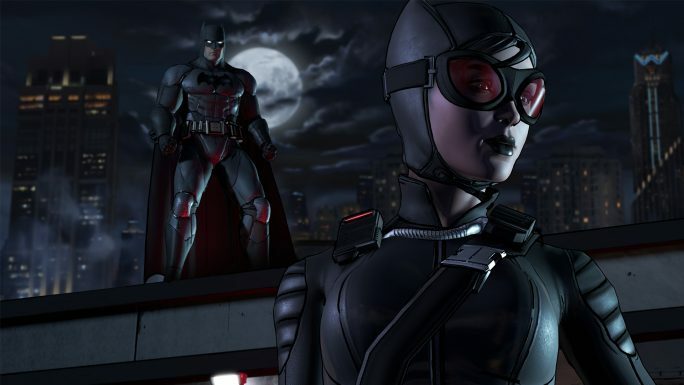 Batman: A Telltale Game Series episode 1 – come on, it’s BATMAN! The DC Cinematic Universe might be flapping about like a fish out of water right now, but it’s good to know that the Dark Knight himself can still spin a good yarn. In fact, it’s not just the Caped Crusader giving us a compelling narrative, but also his time out of the suit as Bruce Wayne dealing with problems of politics and his family legacy. Honestly, I don’t know what else we should have expected, this is Telltale’s Batman after all. 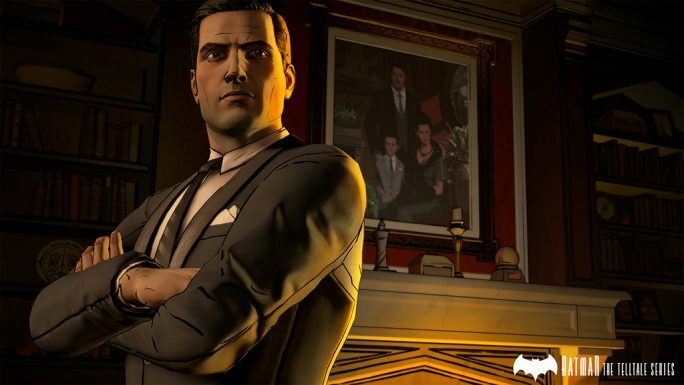 Making quick decisions under pressure is Telltale’s whole shtick, a gameplay style more appropriate to Bruce’s political dealings than Batman’s brutal brawls, and thankfully that’s where the game has chosen to focus. At least so far, this is only the first of five episodes. We can expect a lot more sexual tension to come (no pun intended). Side note: I played Batman on PC, and while I never saw any of the widely reported performance issues when I first booted it up, following the patch that “fixed” them the game simply didn’t progress past the opening logo screen until I disabled cloud saving through Steam and deleted my previous save files. This is the first Telltale game I’ve had any difficulty getting to run, and a patch further breaking things like that is quite disappointing. But once I got the game running though, everything was smooth sailing and I found Batman’s premiere episode to be pretty damn awesome, for the most part. Batman begins (heh) with the Dark Knight (two in a row!) foiling Catwoman’s attempt to steal an encrypted hard drive from Gotham City Hall, before returning to Wayne Manor to host a fundraiser for District Attorney Harvey Dent’s election campaign for mayor. Things get a little tense when infamous gangster Carmine Falcone arrives on Dent’s invitation to broker a partnership, leading the press to think Bruce is in bed with the mob. While defending himself and his family’s name against allegations of corrupt dealings with Falcone, Bruce also gets a visit from an old childhood friend Oswald Cobblepot (the Penguin’s real name in the comics), who is claiming to be bringing trouble of his own to Gotham. The Dark Knight Rises. There, all three. As this is only the first episode of the series, the narrative raises a lot of questions and answers very few of them. But the questions it does ask, as well as the situations it sets up certainly leaves me wanting more of the story, so in that regard the episode is a huge success. Exactly what kind of dealings the Waynes may have had with the mob is certainly the big driving force of the story, and having always seen Thomas and Martha Wayne portrayed as perfect citizens of Gotham makes Batman feel intriguingly fresh. This freshness runs into other areas as well, such as Oswald Cobblepot being a young, tall, anarchist with a personal history with Bruce, rather than the snarling, short cockney gangster he’s often portrayed as. I’m very keen to see where both these stories go. However, again as it is the first episode, many parts of the writing leaning heavily on exposition. For example, while we are spared having to play through Thomas and Martha being killed in the alleyway yet again, there’s a moment where two characters seem to unnecessarily detail it to Bruce himself, describing it in ways that feel really inappropriate to say to the resulting orphan’s face. Or Harvey Dent repeatedly and awkwardly mentioning the planned dismantling of Arkham Asylum in conversation, which seems to be his one and only policy. I wouldn’t say the expository dialogue is a deal breaker, it’s really the only blight on an otherwise well written episode, but it certainly made me flinch at times. 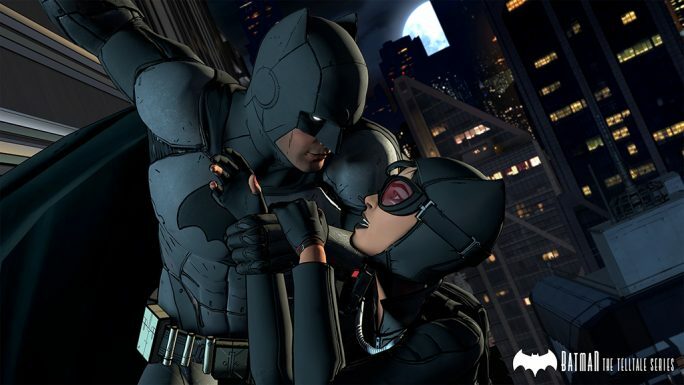 Minor writing issues aside, the cast of Batman are great all around, particularly Troy Baker as Batman/Bruce Wayne and Laura Bailey as Selina Kyle/Catwoman (who both starred opposite one another as the leads in Telltale’s Tales From the Borderlands). Baker, who may be the first actor to play both Batman and the Joker on separate occasions, presents a charming, yet rattled Bruce Wayne while also bringing the goods as an imposing, methodical Dark Knight. His versatility in selling both the light and dark sides of the character, depending on player choices, is exemplary, making every possible avenue of dialogue sound like a logical progression. Bailey is given limited screen time in this episode, but the chemistry between her and Baker makes their encounters very engaging. In fact, my favourite scene of the entire thing involved the two of them meeting as their regular selves, knowing each other’s identities but carefully talking around it to avoid exposure to a third party. The rest of the cast are great too, although hearing Richard McGonagle as Carmine Falcone was a little jarring as his time as Uncharted’s Sully makes it hard to hear him as anything else. But enough about the narrative, let’s talk the video game elements of this interactive story. I know, I know Bruce. stop being so impatient. 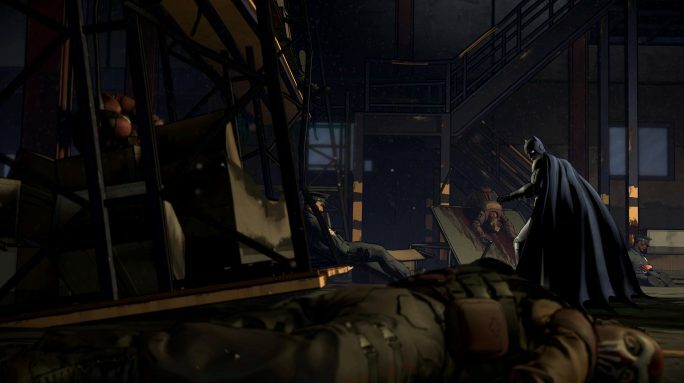 A majority of the gameplay in Batman is the same old Telltale formula, consisting of having conversations where you choose one out of four responses in particular time frames, have fight scenes consisting of Quick Time Events and occasionally freely wander around a confined space looking at things. However, Batman seems to be mixing things up a little bit by offering some variation the those last two elements. In fight scenes, the QTE prompts are worked into the cinematic camera work much like we saw in The Walking Dead: Michonne mini series, but instead of just single button presses sometimes prompts are presented with a contextual direction as well, which sounds like a small change but it certainly tripped me up a few times and made the sequences harder to pass with no mistakes. Unfortunately, it soon became apparent that bar a few instances, you actually cannot fail the QTE sequences and they play out regardless of what you press. The only thing consistently hitting the right buttons seems to achieve is it fills a meter in the bottom of the screen shaped like the Batman symbol, which empties with every mistake. I couldn’t figure out what this meter was for, but my research tells me that filling it would have allowed me to end a fight sooner, but even when I did fill the meter nothing prompted me to do that so unless I missed the tutorial prompt (on two play throughs). 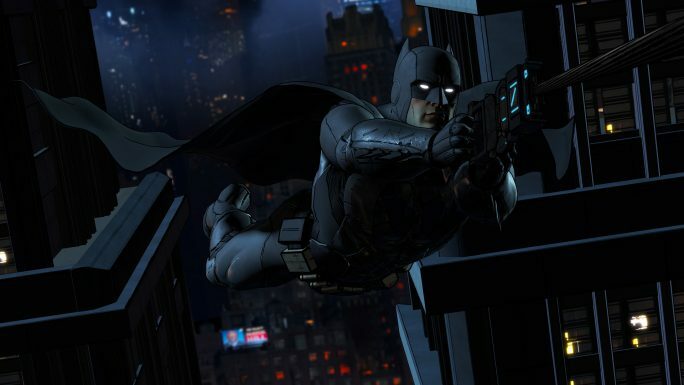 As for the wandering around parts, Telltale are embracing Batman’s detective side and letting players find and connect clues to decipher what happened at crime scenes. While there is no room for error and simply connecting all the highlighted things to their logical counterpart is the only way forward, it still felt more engaging than just looking at things and Batman figuring it all out in a cutscene. Hopefully this idea is expanded upon in later episodes. But keep them grisly, that was cool. The last point I’d like to bring up is the new Telltale game engine, as it’s a bit hit and miss. It makes Batman look amazing; his armour is detailed and battle-worn he’s up there with the Arkham Knight Batman as one of the coolest versions of the character I’ve ever seen. The game’s environments also look just as nice, however it’s the human characters that suffer a little. While Batman’s armour and the environment have their increased detail, human skin has not improved much, and combined with the cartoon crease lines that fade in and out depending on viewing angles, people tend to look washed out. Don’t get me wrong, on the whole this is one of the best looking Telltale games yet, but without upping the detail in character models as they’ve done with other aspects they look bad compared to the rest of the game. But if that and the occasional bit of exposition are my only gripes, episode one has begun what seems to be a pretty intriguing Batman story. Hopefully the pay off is just as good as the set up, but only time will tell. Take back the night with Tom on Twitter: @tomdheath. Don’t forget to follow @load_screen and like us on Facebook.